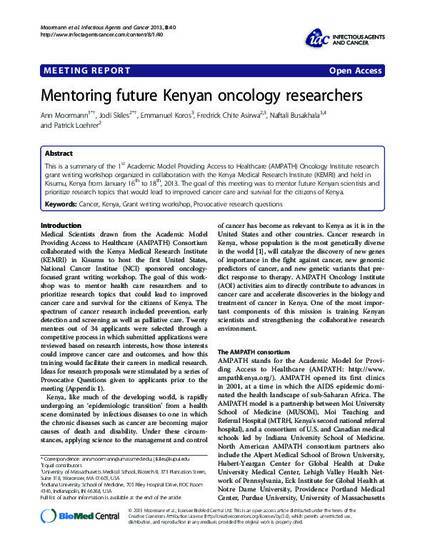 This is a summary of the 1st Academic Model Providing Access to Healthcare (AMPATH) Oncology Institute research grant writing workshop organized in collaboration with the Kenya Medical Research Institute (KEMRI) and held in Kisumu, Kenya from January 16th to 18th, 2013. The goal of this meeting was to mentor future Kenyan scientists and prioritize research topics that would lead to improved cancer care and survival for the citizens of Kenya. Copyright 2013 Moormann et al. ; licensee BioMed Central Ltd. This is an open access article distributed under the terms of the Creative Commons Attribution License (http://creativecommons.org/licenses/by/2.0), which permits unrestricted use, distribution, and reproduction in any medium, provided the original work is properly cited.